Easily schedule, organize, and track appointments, birthdays, and everything in between with your own custom-designed calendars and planner pages. With more predesigned calendar layouts and clip-art images than before, creating your own personalized calendars or planner pages is as easy as a few clicks of your mouse. Plus, you can add even more of a personal touch with the ability to import and edit your own photos. 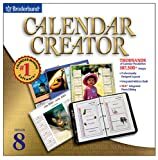 And with features like advanced scheduling, event reminders, drag-and-drop editing, and an integrated address book, Calendar Creator 8.0 can organize even the most complex schedules. 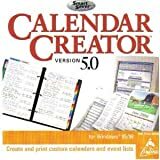 Calendar Creator 7.0 makes it easy to create customized calendars to track your schedule. Stay organized and prepared for schoolevents, sports practices, play dates, doctor appointments, and more.Predesigned calendar templates and thousands of clip art images andphotographs give your calendars the perfect look. Simply select a template,then personalize with your favorite colors, fonts, and images. Fill yourdays, months, and years with photographs of your pet, vacation, high schoolbuddies, or your kids' artwork. For even faster results, let the newcalendar wizard do the work for you. Customizing features include over 3,000versatile clip art images, more than 500 colorful photos, and over 40 fine art images. Calendar Creator 7.0's advanced scheduling tracks your appointments, events, and reminders, then uses the integrated address book to link your contacts to every event. There's plenty of room for names, phone numbers, e-mail and street addresses, and rescheduling is easy with drag-and-drop editing.Create multiple schedules and set reminder alarms. Plan ahead and manageyour schedule weeks, months, and even years in advance. View one or severalschedules at once to avoid conflicts. Schedule recurring events and setreminder alarms in a flash. 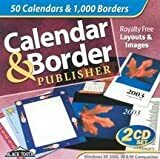 Loaded with powerful organizational capabilities, Calendar Creator Deluxe 9 puts you in control of even the most hectic days. Plus, with thousands of premium graphics, an array of versatile design tools at your fingertips, and onscreen scheduling, you'll never be too busy to express your personal style. Print calendars in a variety of professional formats, manage contact information, or synchronize your scheduling with your Palm OS handheld. Calendar Creator Deluxe 9 delivers everything you need to design creative, functional scheduling solutions for work, home, and everywhere in between. Import events from Microsoft Outlook into your calendar layouts. Use Task List to prioritize important "to do" items. Check off tasks as you complete them, and unfinished business automatically rolls over to the next day. Select and customize a professionally designed layout, or design your calendar from scratch. Customize with more than 135,000 premium images, themed collections, colors--even your business logos. Incorporate images into your customized schedule with powerful new editing options like Tint Control, Repair Tool, Brush Support, and Gamma Correction. Easily add appointments, birthdays, and other important events to your calendar layout. Use streamlined organizational tools to schedule repeat events and edit calendar entries in seconds.